I have a issue when rendering the <pre> under certain conditions. It looks like that having <br> tags inside them breaks the rendering and the content is cut half-way through. I suppose it might also be a max-line-length issue in the renderer. I have attached an example showing this, the text is identical but the first is formatted with <br> tags and the other with regular line breaks. Ah! That's a nice one! 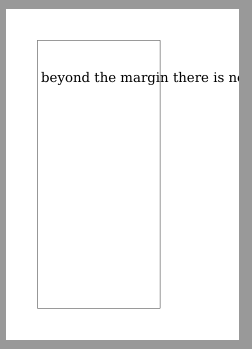 Looks like <br>-outside-the-margin gets lost in (white?) space. OK. The bug happens when preformatted text overfows its parent and when a tag's text ends with a \n character. The bug has been introduced in #557's fix (995a9a3). In split_first_line, we always set the resume_at value to None when the whole text fits in the first line, but that's an error: when the text ends with \n for example, we want to remember the forced end of line and thus keep resume_at. The bug was hidden until the optimization in 22d14ee (done after playing with #483) had been added. As there's no automatic line break with preformatted text, there's no need to check that lines can be broken as forced end of lines are supposed to be handled by split_first_line. I've added extra tests to avoid another regression.